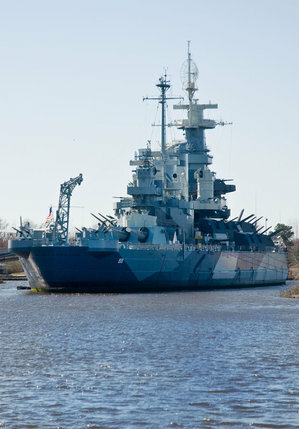 There are several true ghost stories of the USS North Carolina in Wilmington, North Carolina. For years, it has been rumored that this massive ship that resides at Eagle’s Island is home to a number of souls from the spiritual side. If you are interested in historic battleships, and are a ghost hunter at heart, this ship is opened to the public as a museum. Now, you can experience some of the true ghost stories of the USS North Carolina in Wilmington, North Carolina for yourself! The USS North Carolina was commissioned on the 9th day of April in the year of 1941. The Captain of the mighty vessel at that time was Olaf M. Hustvedt. This ship was known at the time as the “Showboat” because of the fact that it was loaded with a number of features and advanced technology of the time. This ship had many roles and responsibilities. One of the main ones being that she created to protect various types of aircraft carriers during several wars. This ship has been a participant in all of the major wars that were encountered in the Pacific Ocean. Nearly two thousand men served as the crew of the ship in her early days. The ship was highly decorated, in that it received fifteen different battle stars for her successful endeavors during the many different wars that she served in. Despite all of the wars that this beautiful ship endured, there were only about ten individuals who lost their lives. It is believed that most of these individuals passed over successfully after dying, but that one spirit still remains. The spirit that has been seen on the USS North Carolina is a young male who has blonde hair. This wandering soul is often seen in the passageways aboard the massive vessel. There also seems to be another spirit lingering around, but this is not confirmed. The true ghost stories on the USS North Carolina always seem to be related to the blonde spirit that is often seen. This spirit seems to enjoy causing disruptions in electricity, trying to talk to the living, and even following certain individuals who board the ship.